The latest version of iOS introduces support for the WebGL standard. This enables the Cesium mapping software to work on iPad and iPhone, without any app, plugin or special settings. This exciting development means that Cube Cities can now visualize any building or floor-level data directly onto iOS devices in the browser without any platform compatibility issues. The same user experience from desktop to mobile browser is now possible thanks to this significant leap forward for 3D virtual world software in the consumer market. What's even better is Apple's latest iPhone introduces the new A8 chip and M8 motion coprocessor. This hardware makes a big difference with our Cesium pages, resulting in the smoothest virtual world application we've ever experienced on a mobile device using our building data. 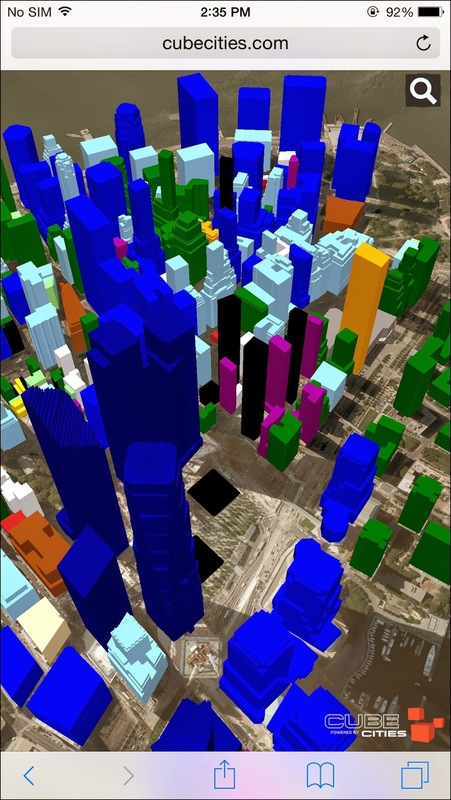 Below is a screenshot of Lower Manhattan in 3D using Cesium on the iPhone 6 Plus. Buildings are colorized in the traditional Sim City usage pattern. Contact us for a demonstration.